While filming our latest documentary Eastern Medicine: Journey Through Asia, Ty and the TTAC team were served a fabulous keto-inspired meal by Chef Donatas Certovskich in Phuket, Thailand. I was so impressed that I decided to re-create the recipe with a few special cancer-fighting ingredients of my own. We’ve shared quite a bit on the ketogenic diet – the low-carb, high-fat diet that has become quite popular… and for good reason. By reducing blood sugar and insulin levels and increasing ketones, the keto diet offers many health benefits. Some use keto for weight loss, while others use it as part of their anticancer protocol. Keto may also benefit those with diabetes and prediabetes. While the diet is enjoyed by many, it involves drastically reducing carbohydrate intake. Because of this, the common cry is a craving for carbs, particularly pasta. 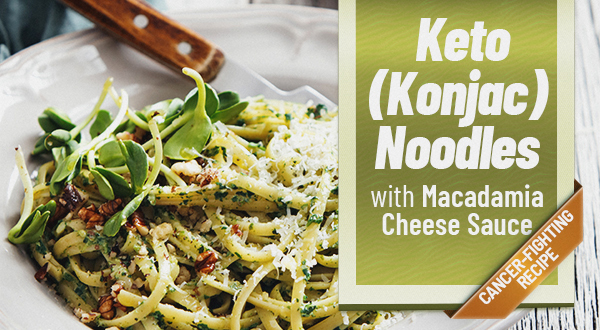 This recipe uses organic konjac noodles, which are a plant-based, low-calorie, no-carb alternative to traditional pasta. They are made with konjac flour and sometimes also oat fiber flour. To serve four, you may need to use two packages of noodles, so be sure to check the package information. This delicious dish gets its decadence from macadamia nut cheese and is loaded with anti-cancer mushrooms, shallots, parsley, and spinach. Macadamia nuts are rich in healthy fats that help with weight control, insulin sensitivity, inflammation, and reduced risk of heart disease and cancer. Hemp seeds are a great source of high-quality protein and essential fatty acids and provide a good dose of vitamin E and important minerals. Spinach is tops for eye health as it is an excellent source of lutein and zeaxanthin. It also contains over a dozen different flavonoid compounds that have anti-inflammatory properties and anticancer-causing components. Feel free to increase the turmeric as it is an anti-inflammatory and antioxidant powerhouse. Add a few garnishes such as hemp seeds and avocado and you have one heck of an anti-cancer, health-promoting & satisfying meal. If you desire more protein, slide one or two poached or sunny-side up eggs on top of each plate of pasta. These noodles are high in glucomannan (the fiber from the konjac root), so it is recommended to avoid konjac noodles completely if you have esophageal issues of any sort. Warm 1 tablespoon olive oil or butter in a large sauté pan over low heat. Add the shallots and mushrooms. Keep the pan covered, stirring occasionally so the vegetables don’t stick. When the shallots are soft and translucent (about 6-7 minutes) add the garlic and turmeric and sauté 1 minute longer. Add half of the vegetable mixture to a blender or food processor and blend 1 minute at medium speed. Add the blended mixture back to the reserved vegetables in pan. Add the spinach and sauté until wilted, about 1-2 minutes. Stir in the cooked pasta. Add the macadamia cheese, using just enough to coat the pasta; mix to combine and until saucy, 1-2 minutes. Season with salt and pepper. Remove from heat and drizzle with olive oil. Transfer pasta to a serving dish. Garnish with additional chopped parsley, parmesan (shaved or grated), avocado, fresh basil leaves, and/or sprouts, if desired. Any leftover cheese can be drained over cheesecloth, chilled, and served with crudité. Want to learn how to use nature’s medicine chest? 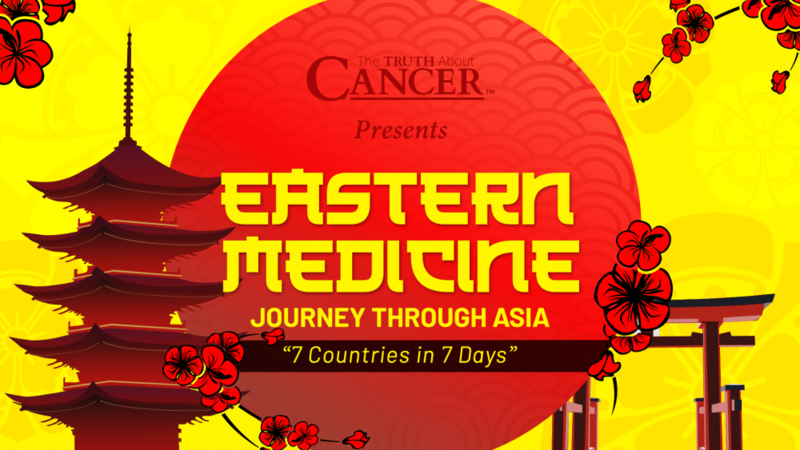 Experts reveal over 140 natural ways to fight disease in Eastern Medicine: Journey Through Asia! Hi Charlene and Ty. I have been watching your program for 3 nights so far. I am currently undergoing chemo. A very strong regimen of it. I am on oral and intravenous meds. I was diagnosed with bile duct cancer and when surgery was performed it was actually on my pancreas. I had a Whipple surgery. I am having a lot of side effects from the chemo and in my second month of 6 that I am supposed to endure. I hated putting the poison in my body. Was so glad to see on the very first night of your program that a doctor actually called chemo a poison. I am trying to pick up tips from your show to help me try to keep my body strong and heal it some as I try to do this treatment. I only wish the USA would have doctors like the ones you have interviewed and would practice these methods of care, and also it would be nice for the insurance companies to accept this type of care for us cancer patients. Thank you both and all your team for bringing this news to us . 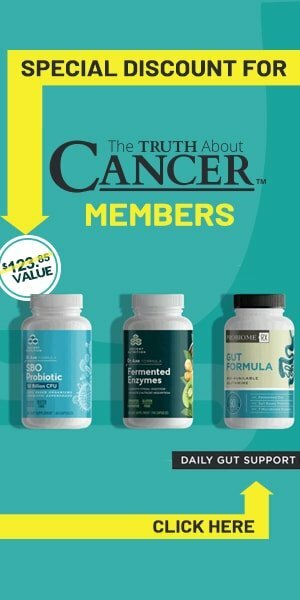 I pray that good will come out of this information and I will be talking with my oncologist about these methods and asking her for alternative care. If you know of someone ?- doctors-? 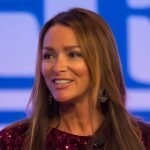 treatment centers in the US – that can help with these kinds of practices and care could you please list those? Thanks again , and God Bless You ALL!! Please know that we deeply appreciate your support of our new documentary. Pasta is mostly carbohydrates with possibly less than 10% of protein. Did you check fat, protein and carbohydrate contents for this recipe to justify your claim that this is a vegetarian keto recipe? The “pasta” used in this recipe is not traditional pasta. It’s made from a vegetable, not a grain.